He also voiced his support on continuing RFS for the sake of national security. Many in the ag community have felt a bit slighted by the Obama administration's outward commitment toward corn-based ethanol. During the National Ethanol Conference, ag secretary Tom Vilsack did not mince words when discussing an industry that has contributed significantly to lowering fuel prices. "We owe ethanol producers in this country a debt of gratitude for the work they do," he notes. Vilsack went on to say thank you on behalf of the consumers. Even though gas prices are pushing toward $5 a gallon in many states, he says they would be nearly a dollar more without the U.S. ethanol industry. 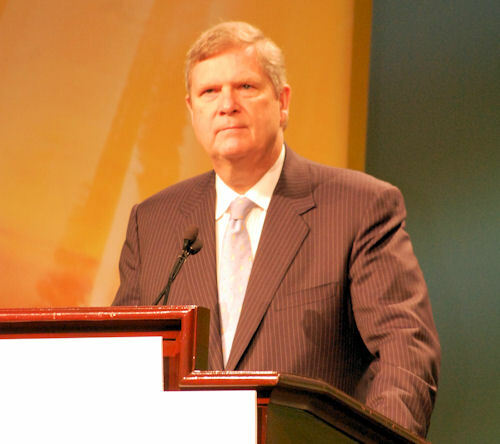 Voicing Support: Ag secretary Tom Vilsack voiced his support of the U.S. ethanol industry to some 1,200 attendees at the National Ethanol Conference in Orlando. He also thanked ethanol producers on behalf of U.S. farmers. He notes for the first time farm income exceeded $100 billion in 2011. Again, due in large part to the ethanol industry's success. Vilsack was also firm on his support of the Renewable Fuels Standard. He notes a number of groups in Washington are beginning to question whether the U.S. still needs RFS. "It is important for the security of this country that we maintain the RFS," he adds. Vilsack also mentioned thanked U.S. farmers for doing their part in supporting ethanol. He notes the reason ethanol has been able to accomplish so much is thanks to the continued productivity increases from U.S. farmers. Since 1980, the ag industry has been the second most productive segment of the U.S. economy. That means things like "food vs. fuel" were little more than non-issue PR stunts. Vilsack explains most developed countries' citizens spend between 15% and 25% of their budget on food. U.S. citizens spend less than 10% on food. "At the end of the day, no one can do their job very well if they aren't fed," Vilsack adds. "We have the capacity to feed ourselves in this country. This is often taken for granted by the 98% of Americans that don't farm."